Have you ever felt that you've read something and it turns out that you've just glanced it? Turns out that I've done that with a very exciting piece of pulp literature; Doc Savage: His Apocalyptic Life. Philip José Farmer's second installment of pulp biographies. The first is Tarzan Alive, which I've been fortunate enough to acquire a copy thanks to Amazon.com. Doc Savage is one of those characters that many people may have heard of, but know precious little about. The Man of Bronze is the pinnacle of human perfection. 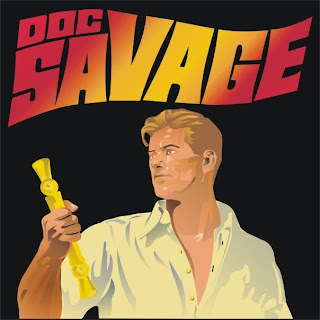 Predating the likes of Batman, Captain America, and even Superman, the history of Doc Savage pushes forth the idea of having a man who rights all wrongs, all the while striving for new advances to make society better. Today, as they were back then, some of the concepts that Doc was pushing for were extreme. His father and he started the Criminal College with the express purpose of doing brain surgery to remove the section of brain which caused a person to commit crimes in the first place! They would later go on to live productive law-abiding lives. I'm sure that some doctors, a century or two ago, might have attempted this in their own way. Still, the actual operation by Doc is an extreme that most people would wince from in fear of what constitutes a visit to the Criminal College. Rehabilitation for criminals in our little corner of the world seems so ineffective, this might actually frighten a few people to going the straight and narrow. I fear for the day that something like this were real. However, it's a sign of the times that they lived in and the faith of a writer in his character that he could so such a thing without causing damage to the person he operated on. At least thus far as I have read, he hasn't made any mistakes along those lines. In Doc's 0biography, it takes us on a trip into the Wold Newton Universe. If you're unfamiliar with that, then by all means look it up! This is the crossover to end all crossovers! To give the best example I can, it explains that Doc's father was a man by the name of James Wilder, a character introduced in the Sherlock Holmes story The Adventure of the Priory School. Wilder was the secretary of the Duke, who was the client of Holmes and also one of the guilty parties in the story. The story's resolution you can read by actually going and finding it, or reading the Wiki entry on it. The gist of the story leads to Wilder not going to jail, but going off to seek his fortune in Australia. According to Farmer's book, Wilder was only there a short time and managed to accomplish this. It also states that Wilder was married at the time and his leaving under the circumstances lead to Doc's birth on the schooner; Orion. In order to escape the wrong doing in his past, he changed his name to Clark Savage Sr., and filed a birth certificate in America for Clark Savage Jr. His mother died a short time after his birth. His father himself was only around sparsely, setting his son through a rigorous training process at the age of 14 months. To go through this is to go through a complex maze of character intertwining. In the same chapter that goes further into depth of Doc's birth, and why certain things were the way they played out in stories, they also mention that he was trained by Holmes, Arsène Lupin, Tarzan, and taught to fly by Kent Allard. Allard might not be a name people are familiar with, but his identity as the Shadow might catch a few people by surprise. As you can tell, I'm a fan of the Shadow, Doc Savage, and Tarzan. I've had some exposure to others, but those three I've returned to time and again. In the case of the Shadow, I've even gone back to the rather dumbed down radio show for enjoyment. In today's society, such things would be considered naive. Still, there's a kid in me that loves the feeling of listening to something and letting my mind fill in the images of some truly fun and ghastly adventures. The Shadow has a few programs that made me shiver a little more than I ever intended to. For those that can find it, listen to Horror in Wax. It's not the only one, but for the Theatre of the Mind's Eye, it definitely stands out to me. This year we mark the 100th year of Tarzan. There are many characters that aren't far behind him. Some that have passed into relative obscurity, and others that have endured. I think if there is a point to all of tonight rambling, it's that there is a responsibility that I feel as a fan to put forth these awesome individuals into the minds of new readers in their original incarnations. Try to bring people into the fold of these genuinely awesome creations that were precursors to our comic book heroes. Some people find that these historical things are dated, and out of touch with today. I'm going to take it one step further and say that it's the very point I'm driving home. These characters aren't today's characters. They fit the mold of yesteryear and are best left to that era. Some of that is good and some of it is bad. There are a lot of things that come across issues that are still as sensitive as they were back then. It was a part of history, and I find that we shouldn't ignore it. Treat it for what it was, a different time and a different age. Let the gold shine through no matter how much tarnish you find. When looking at these individuals in their native forms, try and to apart what was used to create other legends. These weren't just awesome stories, they were building blocks.